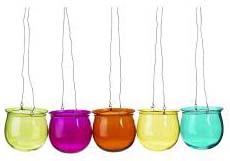 Check out these very funky retro-style hanging tealight holders. They come in red, blue, yellow and green glazing, and have a very tactile, smooth ceramic 'shell' that makes me want to reach into the picture and stroke them. Available from Stylish Life for £9.99, marked down from £16.50. I love pretty candle holders for the garden. There's something incredibly seductive about the idea of having a barbecue or party with lovely little flickering lights all around, made even prettier by coloured glass holders. So, as we're well and truly into outdoor weather now, here's a round-up of some options for colourful tealight holders. 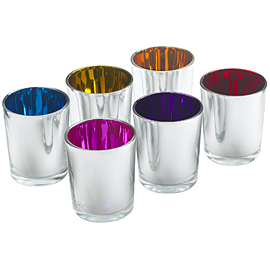 Heal's metallic rainbow tealight holders are a very pretty alternative to glass. They look gorgeous grouped together or individually and are a great price at £5 for a set of six. Update, Oct 2008: these Heal's candle holders are still really popular but no longer available. 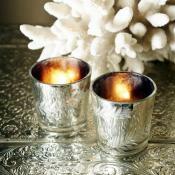 See our similar alternatives in 'Coloured & metallic tealight holders'. Habitat is an absolute treasure trove when it comes to lovely candle holders for outdoor living. Hanging glass tealight holder Nebo shown here in green on the left is just £1.50. At that price you can buy loads and hang them in a tree or on a string in the garden en masse. The Minerva hanging holder (right, shown in orange) is made of cotton with a metal frame and priced at £3.50. The Balina holder is priced at £8 (left in purple). 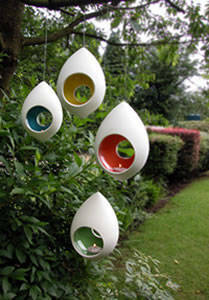 All the hanging Habitat tealight holders shown come in blue, purple, green and orange. You can always count on Ikea for a range of brightly coloured glass tealight holders at bargain prices. The Sommar range includes a hanging holder that's very similar to the Nebo from Habitat above, but priced (surprisingly) a little higher at £2.99 each. There's also the usual votive and squat style holders, plus these cute vintage votive holders at a tiny price: only 99p each! If you prefer understated to bright, check out Graham & Green's silver spiral leaf tealight holders for a bit of metallic glamour. They're £15 for a set of four. 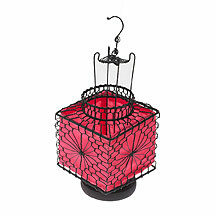 Both Graham & Green and Debenhams offer chinese lantern style tealight holders. Debenhams' version is smaller and thus a smaller price: reduced from £10 to £8 in a range of colours. It's shown here in pink satin fabric with a metal frame. 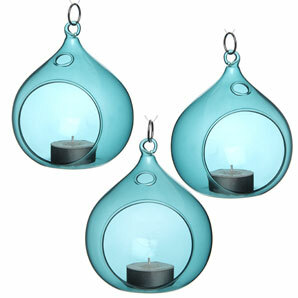 I think my favourite has to be these bubble hanging tealight holders from John Lewis. They come in blue, purple or clear glass at £11.85 for a set of three and have a very tactile, almost retro shape. I can't get over how astonishingly beautiful these votive holders are! I'm seriously in lust. 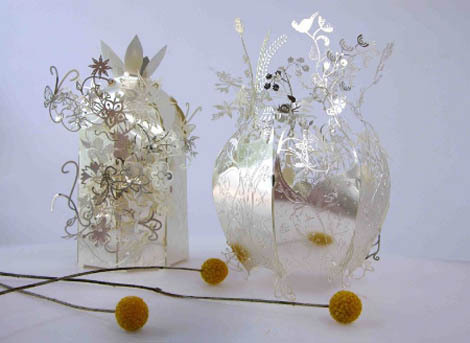 Made by Artecnica and designed by the extremely talented Tord Boontje, they may remind you of his Garland lighting designs that were phenominally successful for Habitat.